Presciently, the State of New Jersey announced a 5-year contract for RFID tracking technology used to assist in evacuation by identifying and monitoring the location of evacuees and emergency assets during hurricanes or other disasters just four days before Hurricane Sandy began to form. Radiant RFID will provide the New Jersey Office of Homeland Security and Preparedness (OHSP) with an RFID-based managed evacuation solution that tracks evacuees, pets, emergency transport vehicles and commodities deployed at state shelters in preparation for and in the event of a hurricane, natural disaster or other incident to assist in reunification of families. Hurricane Sandy formed just four days later, October 22, making for notable timing as New England hasn’t been hard hit by a hurricane since 1938. Who could have seen the devastation to New York, New Jersey and other parts of the East Coast coming when that area hadn’t been hit by a major hurricane for some 70 years? Though New Jersey has not mandated evacuation at this point in time, and may not, parts of Jersey Shore have already been placed under martial law. FEMA, under Homeland Security, proved unable to even supply enough water to victims of Hurricane Sandy, despite days to plan ahead with the storm’s accurately projected course. Yet the same agencies that brought us post-disaster catastrophes like Katrina (where affected populations where treated as occupied enemies) have asked the population to accept and embrace dangerous technologies ripe for abuse. Members of Congress and others have already requested more than $12 billion in new FEMA funding to provide for recovery from Hurricane Sandy, while the agency’s true legacy lies in hampering and blocking the response by local, state and private/community efforts. Radiant RFID claims its technology encompasses 18% of the U.S. population. “Along with the 8.8 million residents of New Jersey, Radiant RFID’s solution covers the State of Texas, State of South Carolina, and City of Boston,” the press release states. The tracking scheme registers evacuees, their pets and other displaced persons with wristbands containing RFID chips that are registered with each individual. These wristbands are scanned whenever evacuees enter buses or arrive at FEMA emergency shelters, enabling Homeland Security to track entire populations during disasters, as well as inventory supplies, transportation and other assets throughout the process. 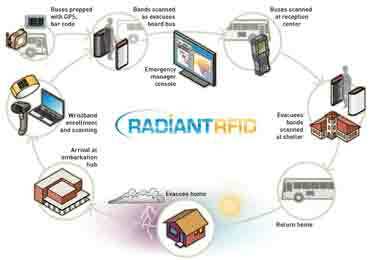 Radiant RFID boasts that their technology helps families to be reunited more quickly, but it also allows FEMA, Homeland Security, and other bloated, big government agencies to once again gain more power from crisis – at the cost of civil liberties and security. Homeland Security / FEMA’s overall inept but seemingly well-meaning response to natural disasters serves as a mask to distract the public from admitted continuity of government plans to circumvent the constitutional form of government under a significant enough national crisis. Many sources indicate that a large scale economic collapse, and the ensuing unrest, would readily fit that bill and RFID tracking technology would serve to control those populations. Wendy Blanks is an independent journalist and reporter. She is the Founder of TruWire Productions, LLC., the parent company of TheSleuthJournal.com. She is also the Chief Editor for the website. She has done investigative research in multiple fields and has a passion for spreading true news, whether it be natural health, government corruption, politics, civil rights and freedoms, technology, business, agriculture, environment and other important topics that plagues our society. She is also Co-Founder & COO for Succor Consulting Group, Inc., a Health IT Firm. Prior to these endeavors, Wendy Blanks was the President & Chief Executive Officer of a National Durable Medical Equipment company & Diabetic Center. You may visit her online store at www.store.thesleuthjournal.com.